How did you do that? 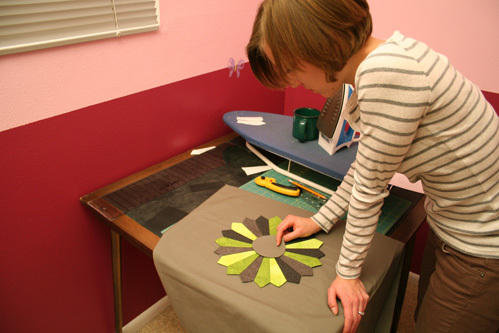 Useful photos and videos of the best tips and tricks for every quilter. Tip to share? Let us know! Being a fairly new quilter, it’s hard to know what tools I need and which ones I can leave on the shelf. For example, I’ve noticed that there is a ruler for just about everything. Many of them are marketed as “must haves” and promise to make piecing simple, fast and perfect. Do they work? Are they worth the expense? Are they easy to use? After recently completing a quilt top, I was left with a pile of large scraps. Scrappy pillows are a favorite quick project, so I decided to use the scraps to make half square triangles for the front of a pillow. I’ve made half square triangles once before using a method I found online that promised to be easy. Cutting them was simple. However, as I sewed the blocks together, I discovered that every edge of the block was on the bias. I had to be very careful to avoid stretching the fabric as I sewed. 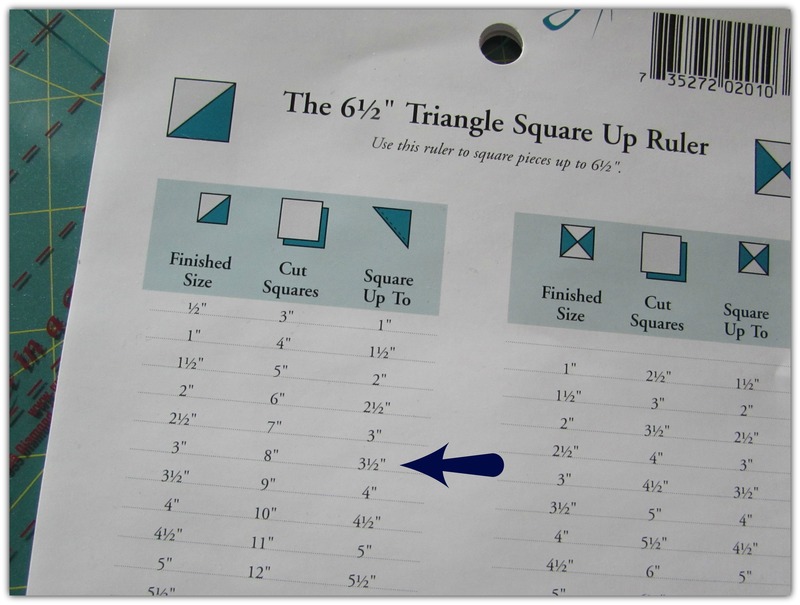 While working at Quilt Expressions, I’ve heard many of our customers and staff rave about the Quilt in a Day 6-1/2″ Triangle Square Up Ruler. I decided to give it a try for my scrappy pillow. For this project, I wanted my half square triangles (HST) to measure 3″ when they were sewn together. Looking at the chart included with the ruler, I was able to determine that I needed to cut my squares 8″. Step One: Prepare the 8″ squares. Step Two: Place two squares, right sides together, on your cutting surface. 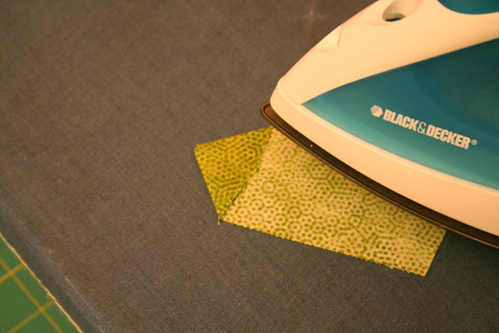 Using your preferred marking tool, draw diagonal lines on the wrong side of the fabric. Pin the two squares together. 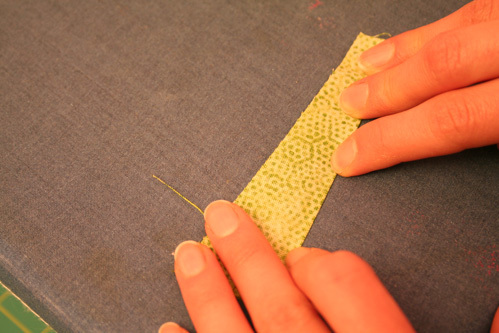 Step Three: Sew 1/4″ on either sides of the diagonal lines with matching thread. Step Four: Press to set seams. Step Five: Lay on cutting mat. The Olfa 12″ x 12″ rotating cutting mat is perfect for this project. Step Six: Cut squares horizontally and vertically and then cut on each diagonal line. You will end up with eight triangles. Step Seven: One thing I really like about this ruler is that the triangles are just slightly larger than they need to be. The directions stated that I needed to trim my triangles to 3-1/2.” Find the 3-1/2″ line on the ruler and lay it on top of the stitching line. Trim off excess. Step Eight: Trim off the dog ears at a 60 degree angle; avoid cutting the seam. Step Nine: Press open. My HST measures 3-1/2″. Once they are sewn together, they will measure 3″. Now it’s time for the fun part! If you are under the assumption that half square triangles belong only in a pinwheel block, do a quick search for “HST” on Pinterest. You’ll be amazed by the number of ways they can be arranged. Quilt in a Day also offers a 9-1/2″ Triangle Square Up Ruler. Karen and Della created a video on the ruler a couple of years ago. If you’d like to see more about the ruler, including how Karen used it to create an entire quilt using the ruler and scraps from another quilt, click here. Do you remember the story of “The Ugly Duckling?” It started with a nest of duck eggs. Somehow, another egg ended up in the nest…a much bigger egg. Once they hatched, the lucky new mom had some cute yellow ducklings and a not so cute big brown…duck? As they grew, those yellow ducklings were quite mean to the brown duck because he looked so different. Time passed and that ugly little duckling turned into a gorgeous, white swan. Imagine their surprise when something not too attractive turned into something beautiful. 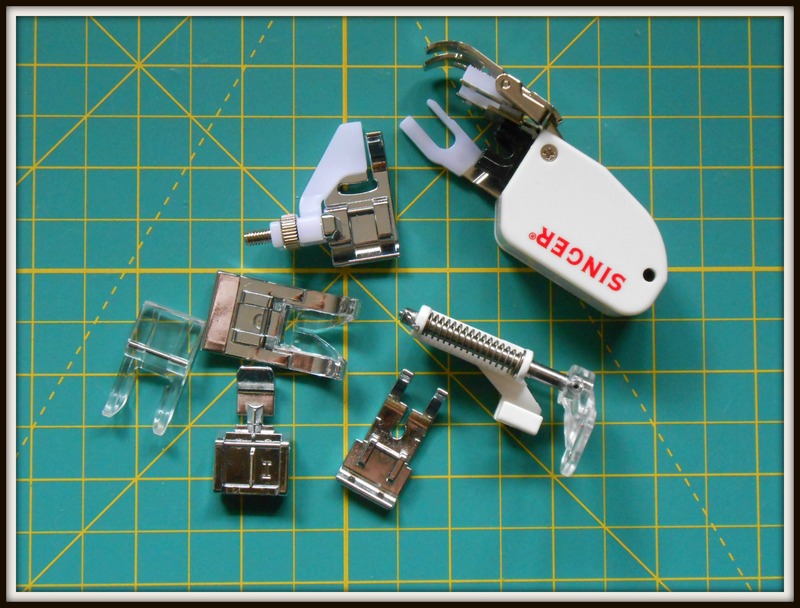 When I bought my sewing machine a few years ago, it came with a bag of attachments. Most of them resembled the 1/4″ foot I was familiar with. I couldn’t imagine why I’d need so many attachments or what most of them were for. I certainly couldn’t fathom why I’d need the big clumsy looking one. I took out the 1/4″ foot and put the bag in the drawer with the owners manual. And there it stayed. About a month ago, I was chatting with a customer as I rang up his purchase. We were both in the process of attaching binding to a project, and he was raving about something called a “walking foot.” Hmmm…sounds interesting…pretty sure I don’t have one. A few days later, I happened to be talking to my mom about the small projects I quilt on my machine…and she mentioned a “walking foot.” After two years, I decided it was probably time to pull out the sewing machine manual and find out exactly what a walking foot looked like, if I had one, and what it did. After a quick read of the manual and a desperate phone call to my mom (who has the same machine), I finally had the walking foot installed. The walking foot doesn’t attach quite as easily as the others, but it sure is worth the extra work. I noticed a difference in my quilting right away. …now the top and the bottom move through the machine at the same pace, resulting in beautiful straight lines without any shifting or wavy fabric between the quilting lines. With any other foot, only the feed dog underneath the fabric is being used. 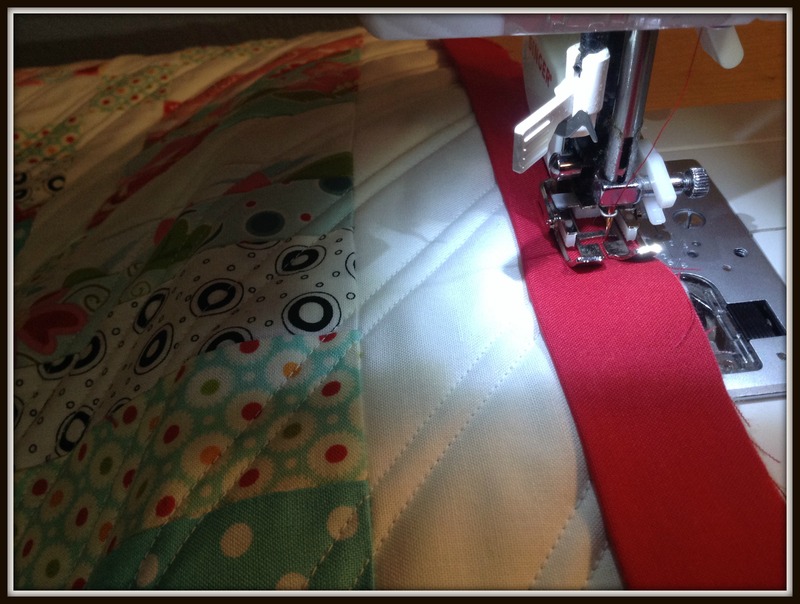 The walking foot creates an upper feed dog, which moves the top of your quilt through the machine right along with the back of your quilt. If you have a walking foot and haven’t used it, I highly recommend pulling it out and giving it a try. It’ll be the big, bulky, odd-looking attachment in your collection. Don’t judge it by it’s looks, though! Sew a few straight lines on a practice piece, and you’ll discover why it is, indeed, a beauty. Last Friday, we did a little moving and rearranging in the store in preparation for Saturday’s FREE Everything Series: Everything You Wanted to Know About Minky. Every chair was full with those anxious to learn a bit about how to sew with minky. With a show of hands, we learned that very few of us have used it. Karen and Della shared several projects and tons of tips with us. Stop by the store soon to take a peek at this quilt-as-you-go quilt. Yes, soon, because I just might steal borrow it for the winter. The front and the back are both minky, with a thin layer of batting in between. It would be perfect for keeping warm this winter or as a floor quilt for a baby. 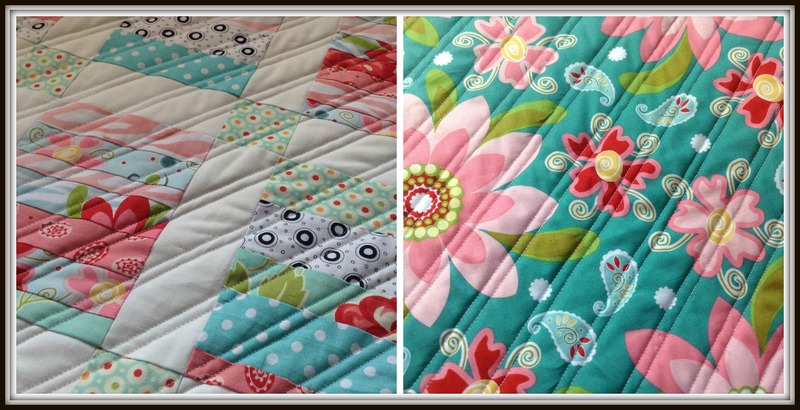 The free pattern for the Cuddle Strip Quilt from Shannon Fabrics can be found here. While making the Cuddle Strip Quilt, Karen and Della knew they’d be fighting the minky as it stretched and moved as they sewed. To help with this, they used 505 Spray and Fix Temporary Adhesive. The basting spray is used to adhere first the backing to the batting and then to adhere each strip layer as it’s added to the quilt. I used 505 when I made the i-pad envelope and found it easy to use and very helpful. Just don’t forget to protect your surfaces and the rest of the quilt from overspray! Old sheets work great for large areas and freezer paper is best when applying the 505 to the strips. Oh, texture…I love texture. Look at that photo on the right! Wouldn’t this pillow look gorgeous on your bed? (Yep, along with that Cuddle Strip Quilt!) Some of the minky comes with texture. If you take a close look at the photo of the quilt, you’ll see dots, a paisley print, and stripes. This grey minky, however, did not come this way. Karen and Della used a product called Texture Magic. It is layered on the back of your fabric and then sewn on. In this example, the pillow front and the Texture Magic were quilted in a grid pattern. Then, following the manufacturer directions, they applied steam (not direct heat!). 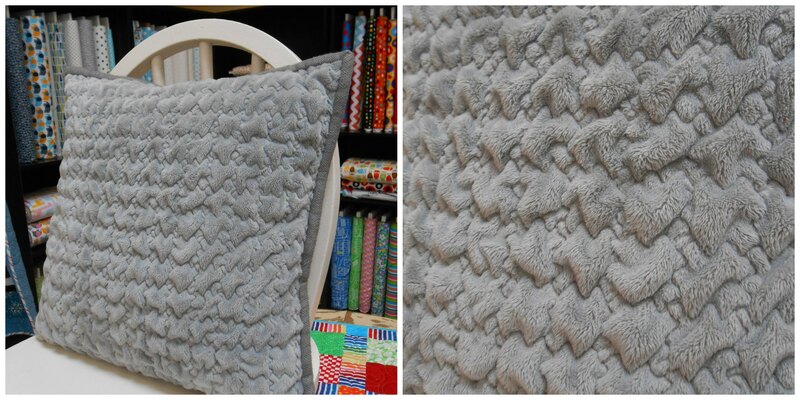 This caused the pillow front to shrink up to 30%, resulting in that amazing texture. Texture Magic is available at Quilt Expressions both prepackaged and by the yard (47″ wide). I think that Karen had a favorite project this time. Stop in the store and, chances are, she’ll be wearing one of these infinity scarves. 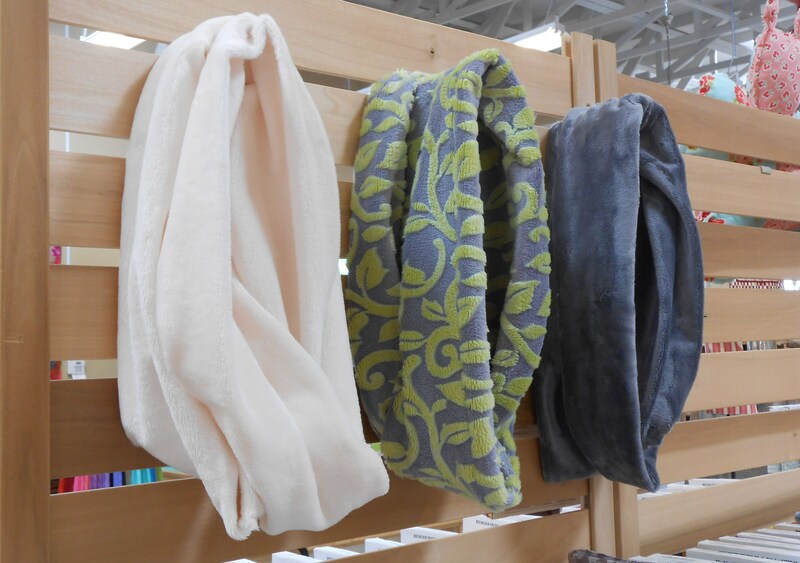 Imagine a layer or two of minky draped loosely around your neck this winter…so cozy and warm! This project takes just a small cut of minky and would make great holiday gifts. The pattern is provided free with a minky purchase. Stop in the store for more helpful sewing-with-minky hints and to take a look at our selection of solids, florals, kids’ prints, chevron, and animal prints. You can also take a peek online by searching with the keyword “minky”. I’m going to step out of my comfort zone a bit more (I’ve survived sewing from a pattern so far!) and sew with minky. I’d like to try something besides one of the projects shown above and would love suggestions. 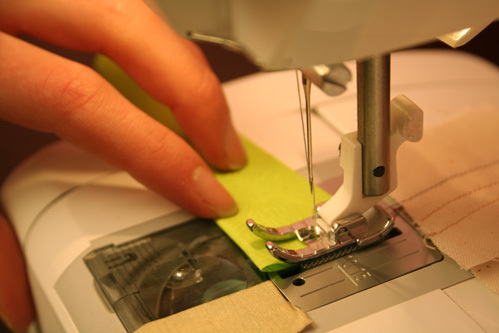 If you’ve sewn with minky, please leave a comment and tell us about it! 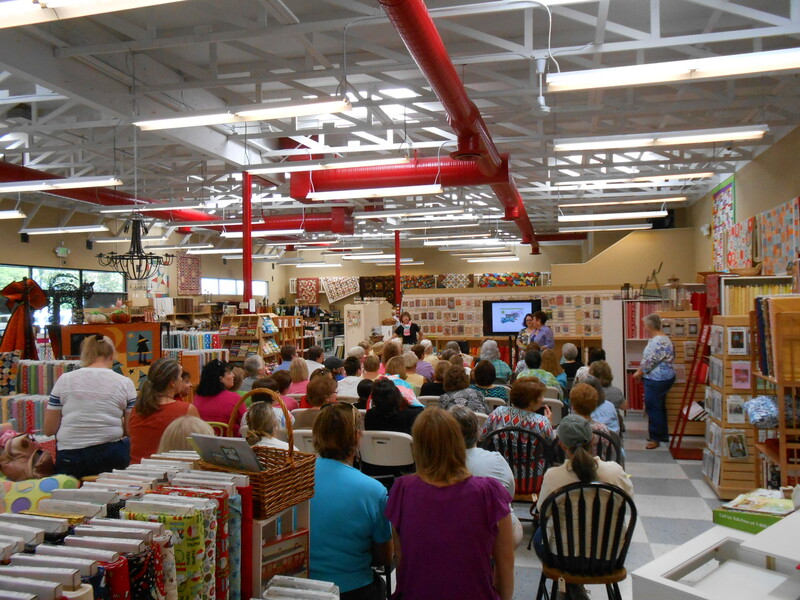 Join us for our next FREE Everything Series: Everything You Wanted to Know About Color and Value on Saturday, September 7 at 11 a.m. and 2 p.m. Stop in or call today to reserve your seat. We spotted this quilt, “Big Stripe Hexagonal” at Fall Quilt Market and knew we had to make it. The coolest part about this hexagon quilt? It’s made using just one fabric! To get the hexagon effect, the striped fabric is cut out using a 60-degree triangle ruler and pieced back together in rows. Neat! All you’ll need is 4-1/2 yards of fabric. 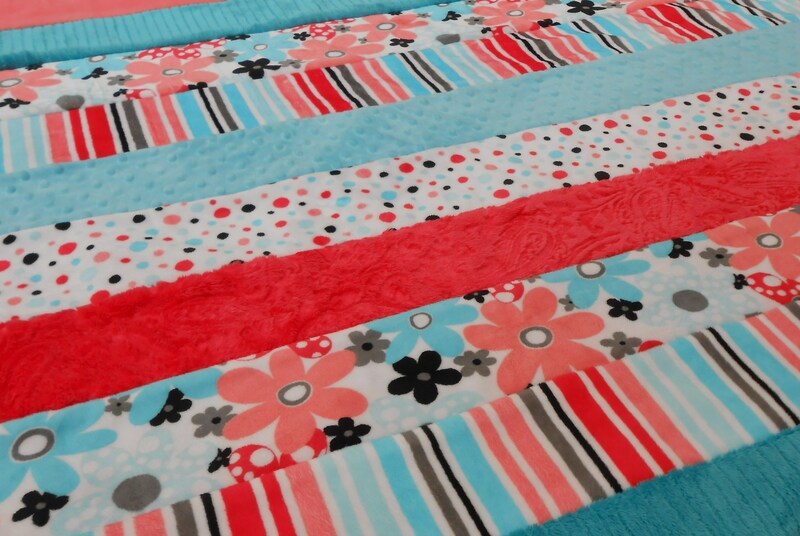 We have the stripe used in this quilt in two colorways. Buy enough fabric to make this quilt and we’ll throw in the pattern to get your started, or check out the pattern online on Michael Miller’s website. 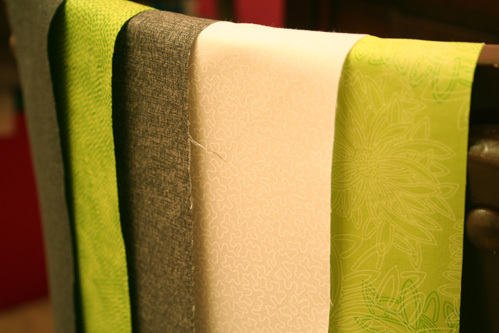 We now have the Simply Color line by V & Co for Moda Fabrics. The line includes several colors of ombre prints (where the color graduates from dark to light) which make really unique quilts. 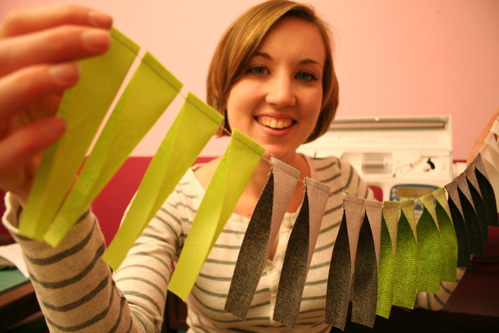 Jane, our Moda rep, gave us a great, modern idea on how to use the ombre fabrics. I knew I had to try it out. Here’s a quick tutorial on how to make a “pixel” quilt. It’s a really fast and easy project. I used just one color of ombre, but picking two or three ombres in coordinating colors would make a stunning quilt as well. You will need a total of 3-1/3 yards of ombre fabric to make a 54” x 70” finished quilt. First, cut your fabric into (24) 5” strips. Then, subcut the strips into (192) 5” x 5” squares. You will be sewing your squares together at random, so first you need to mix up your neat stack of squares. I did this by “shuffling the deck” and spreading all the squares out across my cutting table. Then, I dumped the pile into a bag and mixed them up even more. Sew the squares together at random into (96) two-patches. The beauty of the pixel quilt is its randomness. However, at this stage I was careful to mix up the tones of the fabrics so there was at least some contrast between the two squares I sewed together. Press your two-patches to one side. Then, sew your two-patches together to make (48) four-patch blocks. Press seams to one side. Arbitrarily arrange your blocks into eight rows of six blocks. You’ll want to double check your seams alternate so they “nest” when you sew your blocks together. You can either rotate your blocks to make them fit, or you may need to re-press some of your seams. Sew your blocks and rows together and ta-da! You’re all done. I love how modern and graphic the end-result is. Della gave me several ombre fabrics after her sewing-room purge and I’ve started making miniature pixel quilts to hang in my sewing room. Have any great ombre-fabric project ideas? Please share in a comment! Our latest video features the Triangle Square Up Ruler – one of our favorite tools! It makes half-square triangles a cinch. Take a look to learn more about using this handy notion. It was no surprise to me when Kat came to me a few weeks ago and threw an idea at me — to do a Dresden tutorial on the blog. For those of you who don’t have the pleasure of knowing Kat, she’s a Dresden expert and has designed many popular Dresden patterns. Take a look here – her designer name is Cottage Creek Designs. I’m always looking for good blog post ideas, and as I’ve been feeling up to a challenge, here we are. The “Dresden Plate” is a traditional American quilt block that is made using a combination of patchwork and applique. It has a versatile design and looks great in both traditional and modern colorways. Although the curves may look intimidating, it is a fairly easy technique to pick up – especially with the right tools! So, off we go. 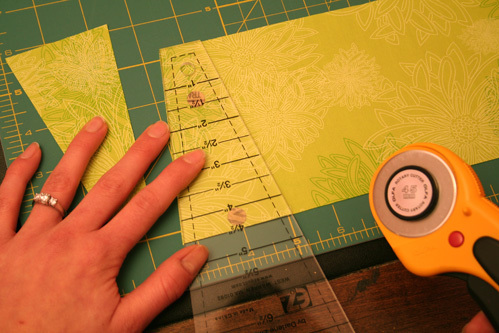 The first step to making a dresden block is to get your hands on an EZ Quilting “Easy Dresden” ruler. We sell them in our shop and online store. These rulers include really great step-by-step instructions to help you through the process as well. Next, pick out some fabrics that tickle your fancy. You can really shape the overall dynamic of your block with your choice of fabrics. You can go high-contrast, tonal, scrappy — you name it. You’ll need a total of 20 “blades” to make one Dresden circle (10 for a half-circle, 5 for one “fan”). If you want a scrappy look, you can pick 20 different fabrics, or choose just a few fabrics and make several blades of each color. Now pick a size that works for whatever project you’re working on. I decided to keep it simple and make a pillow, so I did a 4 ½” blade. 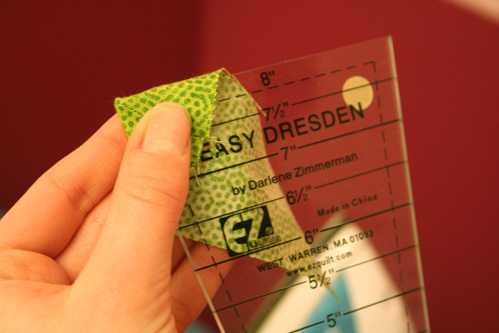 The instructions booklet in the Easy Dresden ruler has a handy chart that tells you how big your finished Dresden Plate will be for each blade size. For example, it says a 4 ½” blade will make an 11 ½” finished plate. 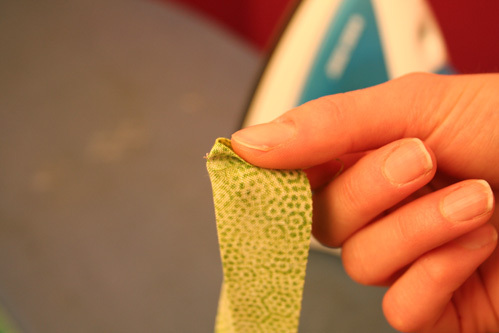 Next, cut your fabrics into strips the same width as your blade size. Then, using your rotary cutter and Easy Dresden ruler, cut all the “blades” of the dresden, alternating the direction of the ruler each cut. Time to sew. 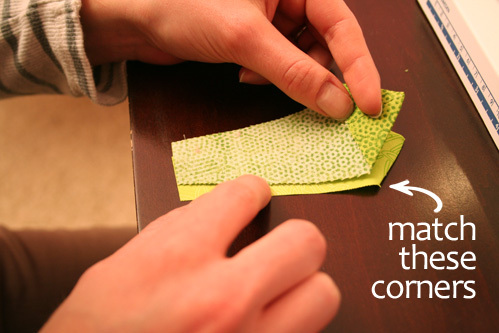 For this first part only, shorten your stitch length to get your stitches tighter than normal. 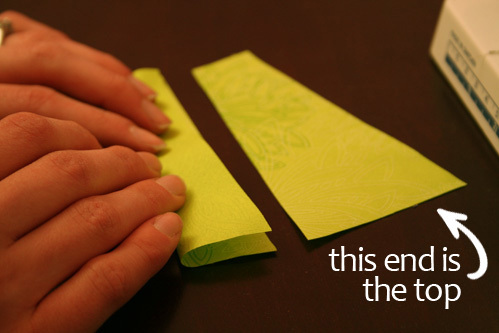 Grab one blade and fold in half lengthwise, right-sides together. 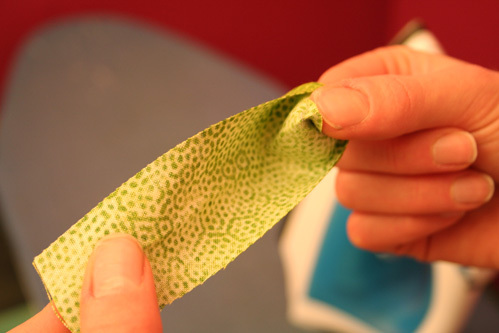 Sew a ¼” seam on the “top” end of the blade (the longer side), being sure to sew from the raw-edges to the fold. Chain-piece all your blades. Snip your blades apart. 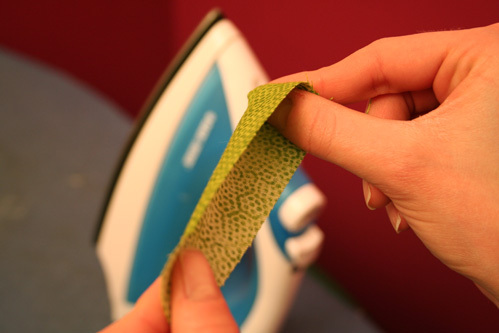 Next, finger press the center crease, or use your iron if you want a really defined line. Then, put your pointer finger “inside” the blade, thumb on the top and pinch your fingers together, flattening the seam open. Then, turn the blade right-side out and use the tip of your Dresden ruler to push out the point. Before you press flat, match the center of the open seam to the center crease to make a perfectly proportionate blade. 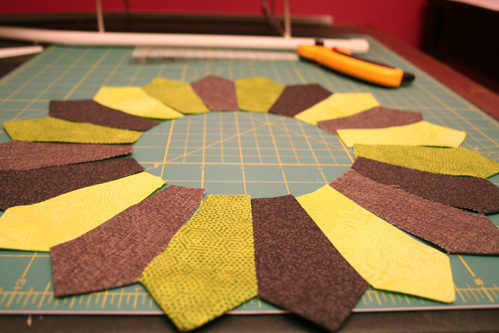 Next, lay out your finished blades into a circle, distributing your fabric colors/patterns as desired. I panicked a little when I got to this point. I wasn't expecting the center "hole" to be so HUGE! Thinking the same thing? Don't fret. The hole shrinks down as you sew your seams. ALSO: Notice anything missing? How about that pretty white meander fabric I had picked out? Once I pressed my white blades out, I realized you can see right through the fabric and can see all the folds on the backside. That won't work! I had to make one more of each of my other colors to compensate for the loss. Oh well! Before sewing this next part, remember to put your machine back to your regular stitch length. Take two adjacent blades, put them right-sides together and match the top corner points together. Bottom-edges won’t show, so it’s not as important that they match up. 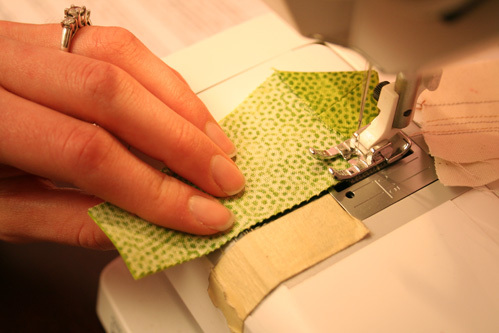 Starting a ¼” down, backstich to the top, then sew down to the bottom using a ¼” seam. This hides your threads and secures the top of the stitch. Be careful which blade sides you sew together! After laying my whole dresden out just how I wanted it, I started sewing the wrong sides of the blades together and ended up with something totally different from my original plan. Oops! Join the rest of the blades, making a full circle. 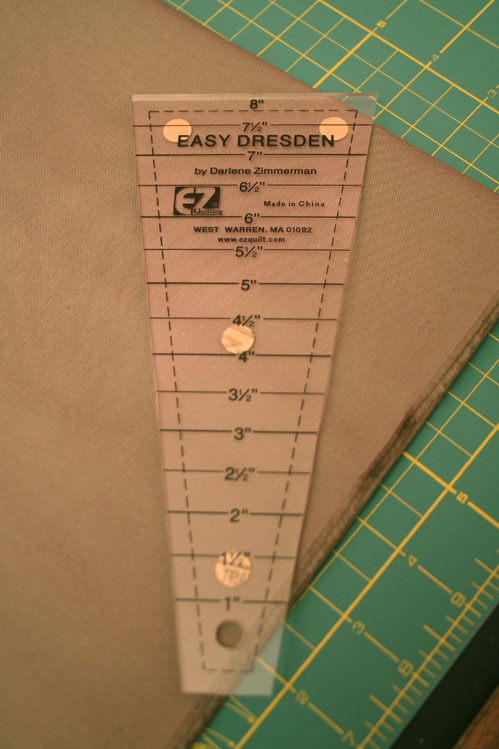 Then, press your seams in one direction to get your dresden to lay flat. Woo! Almost done. Pick a center fabric and decide how big you’d like to make your inner circle. 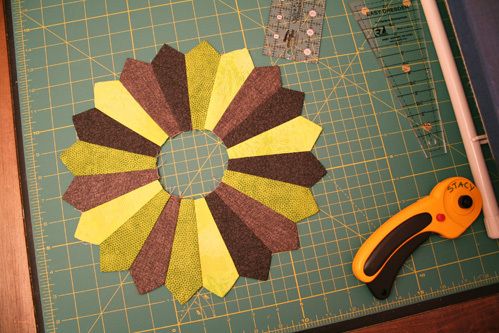 A small circle will give you a flower-y look and big will make your dresden blades look more like a decorative border around the center. 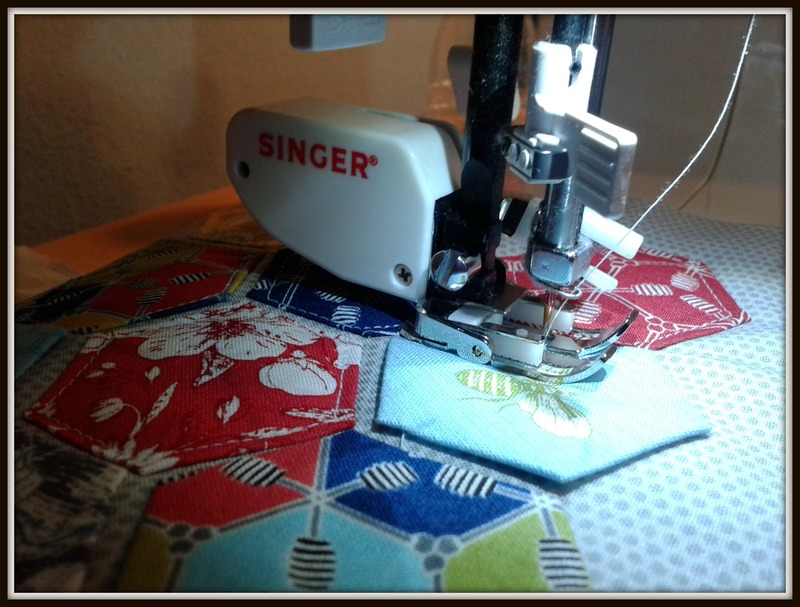 Making your center circle can be done using any applique method that you prefer. If you are working with transparent fabric, like white, here’s what to do. 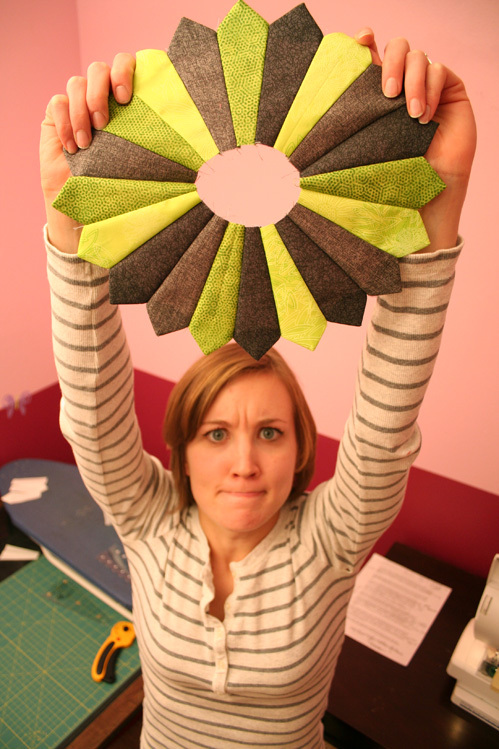 Draw a perfect circle onto the wrong-side of two pieces of your center fabric. Fancy-schmany Perfect Circles by Karen Kay Buckley will give you a wide variety of sizes to choose from, or a bowl or mug borrowed from your kitchen work just fine, too. Cut out your circles. 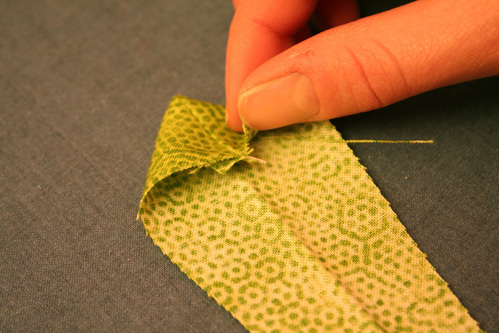 Place them right-sides together and sew about a ¼” seam all the way around. Clip the seams. 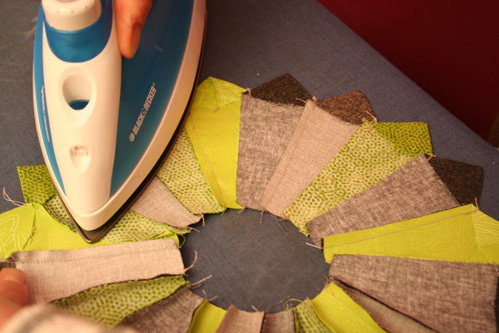 Cut a 2” slice into one of the circle-fabric pieces. It helps to pinch both sides and pull apart as you are cutting. Turn your circle out through the hole and press flat. Kat warned me that this method will make your circle look more like a dodecahedron. She was right. If your fabric isn’t transparent, Kat suggests cutting a perfect circle out of your fabric, applying a few layers of freezer paper, then use starch around the edges to turn under your edges. You’ll get more rounded edges this way, although it seems like it takes some practice to make it perfect! It’s applique time! Position your dresden where you want it. There are about a million ways to applique these babies down, so do whatever you prefer. We like to dab a bit of Quilter’s Choice Basting Glue at the end of each blade to temporarily attach it before we applique. Then, machine or hand-applique everything down. Pick your favorite stitch — blanket, zig-zag, satin or just straight. Hmm..I think I should change up the center color. Maybe black? Now that you know how to do a dresden, get sewing! There are a gazillion cute projects out there. We created a Pinterest board full of Dresden projects to pick from. Dresden Rose & Dresden Fans are some favorites of Kat’s designs. Check ‘em out! The Easy Dresden ruler comes with a free pattern, too. Need a smaller project to get you started? 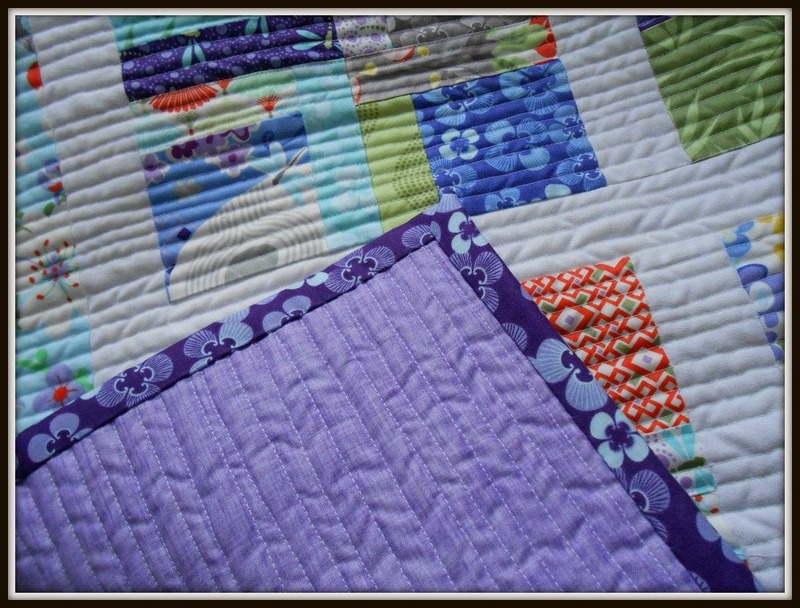 Try a placement, table runner, pillow, pouch or just frame one block for some sewing-room art.